This site is also available in Dutch. Klik hier voor Nederlands. The Sudoku puzzle of the week is a level 5 sudoku puzzle. It's a nice challenge for advanced Sudoku players. Go to the "Sudoku puzzle" section to solve this puzzle immediately! Sudoku beginners can also go to the "Puzzle section" to solve easier puzzles. Ganbade! 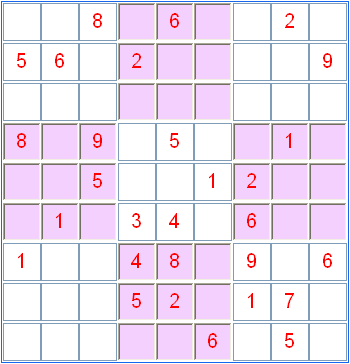 A sudoku puzzle comprises 9 rows, 9 columns and 9 blocks. Each of them must contain all numbers from 1 to 9. More explanation can be found at the "rules section".